There was a time, way back in the fledgling years of the digital age, when paint software was a very fancy thing to have on a computer. It cannot be understated just how much we take for granted the mere double-click of a Photoshop or MSPaint shortcut to let our artistic juices flow these days. Back before the days of Adobe and Microsoft came along to help young adolescents realize their artistic dreams (which, if me or any of my school peers were anything to go by, involved drawing lots of penises), you had to take a more expensive route to get your kicks. The likeliest of these would involve getting yourself either a high-end Commodore Amiga or PC - either of which would require your parents donating a kidney or two to afford. And even then, should your folks take that plunge and make your local hospital very happy customers, there was no guarantee that the software you got was intuitive enough to create anything more with it than a malformed stick figure. Which is fine, if you like drawing malformed stick figures (or even malformed stick dicks). Not so much, if you’re trying to recreate Van Gogh’s Sunflowers. While these various computer packages - Deluxe Paint, Paint Shop, and all the other Paint-titled pretenders - may have been the first to put the power of digital art into the hands of the non-professional, such hands were, thanks to the complexity of such programs, ultimately those of an older crowd - leaving the average kid’s phallus-scribbling aspirations to be realized only via a sharpie on the walls and doors of high school toilets across the world. For the console kids of 1992 though, such problems would end up being solved by an unlikely saviour. At that time, Nintendo were already a company that needed no introduction to the entertainment world. Having continued to ride a wave of momentum that had carried them out of the 80s with the success of the NES, their 16-bit Super Nintendo counterpart was proving to be just as much of a hit in the video game market too. In Japan, America and Europe, Mario and his merchandise were practically everywhere - on pencil-cases and mugs, in cartoons and commercials, and it would only be another year before he’d get his first (and at time of writing, last) feature length live-action movie too: the horribly ill-realized Super Mario Bros., a film so bad it warrants its own write-up here at a future point. But regardless of the Hollywood failures to follow, both Nintendo and Super Mario games ruled the console roost in ‘92 (irrespective of what any Sega fan will tell you, and I love that company just as much), and they were in a position to do pretty much whatever they wanted with their product line. Nintendo being Nintendo, naturally this would result in them stepping in a completely unexpected direction - and unleashing Mario Paint, a drawing program filled to the brim with the charm of its flagship character, upon the world. It was a bold move. The thought of an art package for a platform considered to be a ‘toy’ by the mainstream computer crowd was a laughable notion at the time. 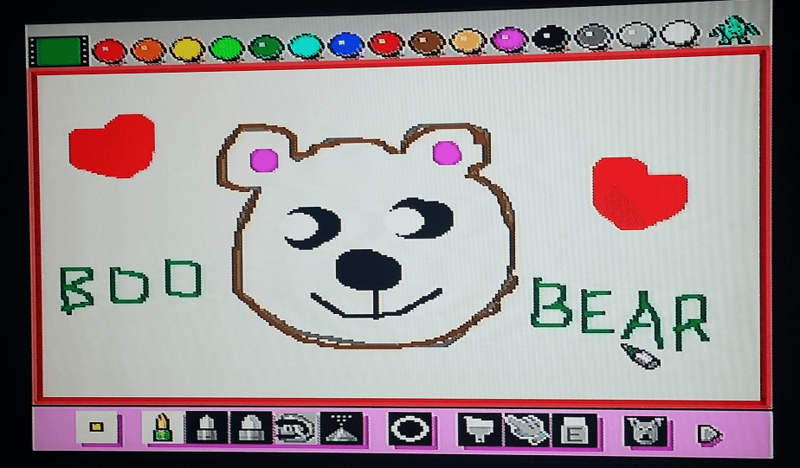 After all, the older, geekier computer nerds knew best: paint programs were for sophisticated people on sophisticated systems, and who on earth could draw anything with a SNES joypad, anyway? 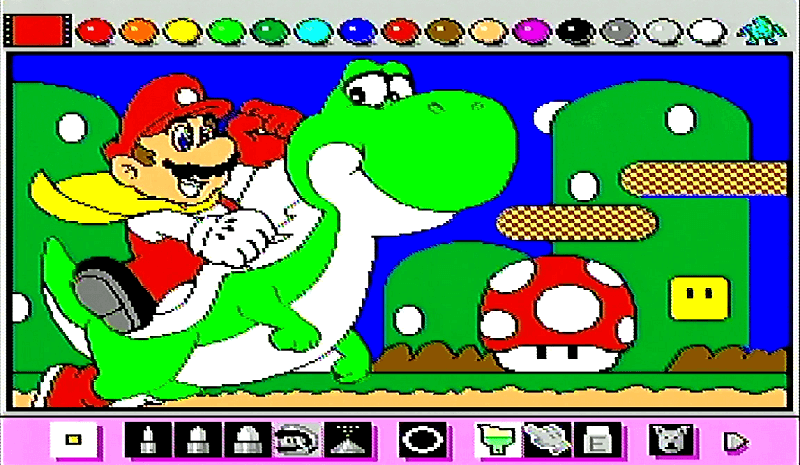 Mario Paint wasn’t built for the SNES’ native conventions in mind, though. The joypad was thankfully done away with, and instead, every copy of Mario Paint shipped with the SNES Mouse - a peripheral that only saw other use through the additional creative suites that followed Mario Paint’s lead, or complicated strategy simulations - the likes of which the PC had a dime a dozen. 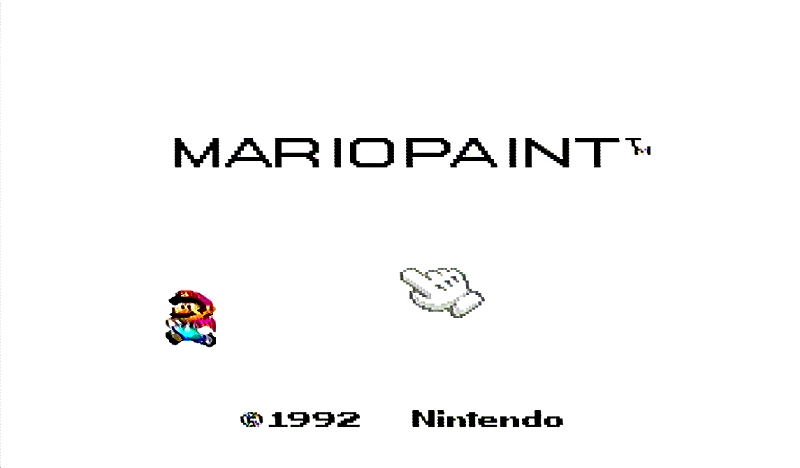 But even if Nintendo felt their new software had to adopt both computer-sourced tech to be a success, this was still Nintendo - meaning that Mario Paint had to be every bit as quintessential a Mario product as any of its sibling titles aspired to be. Even right down to the title screen. Gamers familiar with a certain Wii U title by the name of Super Mario Maker might find similarities in the quirkiness just hiding behind Mario Paint’s starting splash. Ever wonder where Maker’s easter-egg interactions with its title letters came from? Look no further than this game. Granted, Maker’s effects aren’t quite as weird as Paint’s - just what is up with that babbling toddler R? Or the exercising eraser-people at the end? - but the offbeat sense of spirit is more or less identical. The potential for creation doesn’t quite cover itself as deeply for the music maker however. It does allow you to make quaint 20-second ditties, complete with a full musical scale and a drag n’ drop style of operation. Unfortunately, the limitations in this department also lend themselves to the lack of instruments available to build your melodies with. Not to mention that the images for each instrument type don’t make a whole deal of sense. Collectively, both paint, animation and music could also be used together to create more intricate pieces of work, and even whole mini-cartoons. Veterans of Internet culture may well remember just how much this combination, when used skilfully, contributed to the media of the Web’s yesteryear - cult webtoon Homestar Runner, for example, had the honour of its first ever episode being animated with this very application. Such feats were obviously done in the midst of stretching Mario Paint to its limits, but it was just one glowing demonstration of just what could be done - not bad for a package that could only ever save one picture at a time (and for which the manual amusingly suggested to ‘use a VCR’ to save any additional efforts). And even if you got bored with the whole thing and fancied a break, you could do that too - via a mouse-driven mini-game. Yup, long before even Flash came along to give us a horde of click-happy time wasters, Mario Paint featured its own - involving with the job of swatting down some nasty digital bugs for the sole purpose of, hey why the hell not? As far as such games go, it’s not bad - although the SNES Mouse’s trackball-driven antiquities make the thing a bit cumbersome at times. Thank goodness the pointing devices of today don’t suffer from such problems - cleaning gunk out of mice in the pre-wireless days was a monthly ritual preferable only to getting your teeth pulled out. If you’re curious on how I did with this little distraction, well I made it to the boss, so that’s kind of okay for a one-off play just to show off an old SNES classic, right? In terms of the drawing tools themselves though - well I did sit down with the missus to indulge in an evening of fine, Mario-influenced art. Unfortunately, this evening also did involve some consumption of red wine, so the techniques of the masters weren’t so much left unemployed, as kicked into the dole queue to ask for benefits every week. I like to think that this version of Mario - if it is indeed Mario and not Ron Jeremy in disguise - exists somewhere in a timeline where Nintendo didn’t quite manage all the lucrative successes they now lavishly bathe in, and have since gone bankrupt, leaving its once-proud brand face with an alcohol problem and an elongated left arm. That’s what his utterance is all about too - he’s desperate for someone to recognize him! Or, it may have just been me trying to stick a verbal signpost on him after my wife questioned who the hell I was trying to draw. Whatever, art is subjective. Not bad, right? Although I’m not sure the hills in the background are right. At least Yoshi’s the right colour. 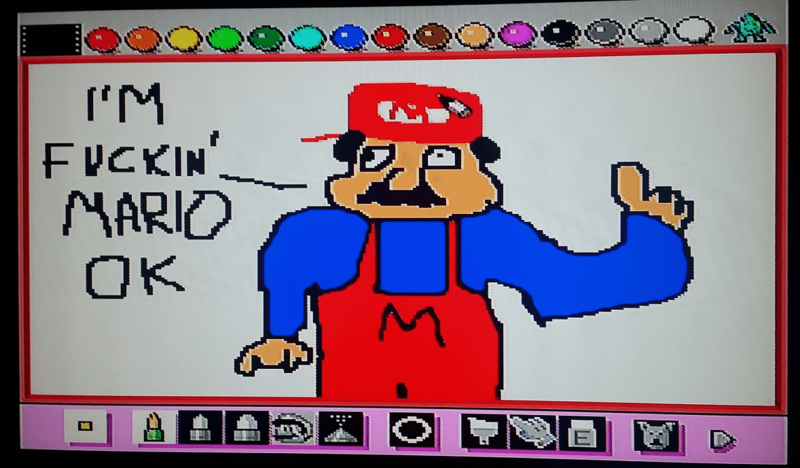 Nonsensical goofing aside, a mere messing around with Mario Paint is enough to prove its justification as one of the many milestones upon which Nintendo has built its reputation for innovation. It proved that games consoles weren’t restricted to only providing their users, well, games - there was plenty of room for the odd creation utility as well. In Nintendo’s case, building such software may even have had a profound effect on their later platforms too, given how revolutionary - and pointer-based - both the Wii and the Wii U were. PC equivalents may have beat it comfortably in terms of intricacy, but that wasn’t point. For many young Super Nintendo owners, Mario Paint was a gateway into the world of creative arts - and a tremendous amount of fun too. Mario Paint is still available for purchase in its original, boxed form from various sellers on eBay. Even with its collectible nature, prices can still be decent - I picked my copy up for $49.